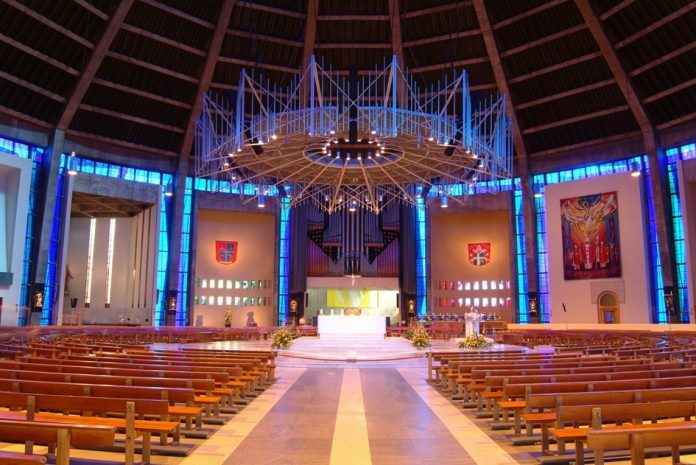 18269 days since it’s consecration, see the awe-inspiring interior of the Metropolitan Cathedral like you’ve never seen it before as renowned new media artist Andy McKeown presents a new large-scale light performance in collaboration with the world-famous Metropolitan Cathedral Choir. Taking inspiration from the Cathedral’s architectural features, in particular the circular Lantern Tower, light is projected within the building itself while the choir presents a rare live performance of Thomas Tallis’ Lamentations alongside organ music by Olivier Messaien and Arvo Part, performed by Matthew Searles, in a profound and breathtaking collision of old and new. Performances at 19:00, 19:45 & 20:30 (Lamentations first 20mins of each performance; followed by organ music). The final performance will be followed by ‘Reiteration’, a layered soundscape of voices and ambient sounds from the Cathedral (21:10 – 21:30).